Do you have one or more apple trees that have vigorous new upright growth, like the shoots, often called water sprouts, shown in the picture? This photo shows new growth on an espaliered Gala apple in my garden, before and after pruning (click to enlarge). Those shoots, usually at least one foot in length, are the tree’s response to heavy pruning during the dormant season, and represent an effort to restore the balance between the canopy and the root system. Water sprouts are unlikely ever to bear fruit. Instead, they sap the tree’s energy and shade the interior of the tree, slowing the development of vertical growth, and the time for dealing that problem begins now. The period from early August to mid-September is the ideal time for summer pruning, after the new branches have set their terminal buds. 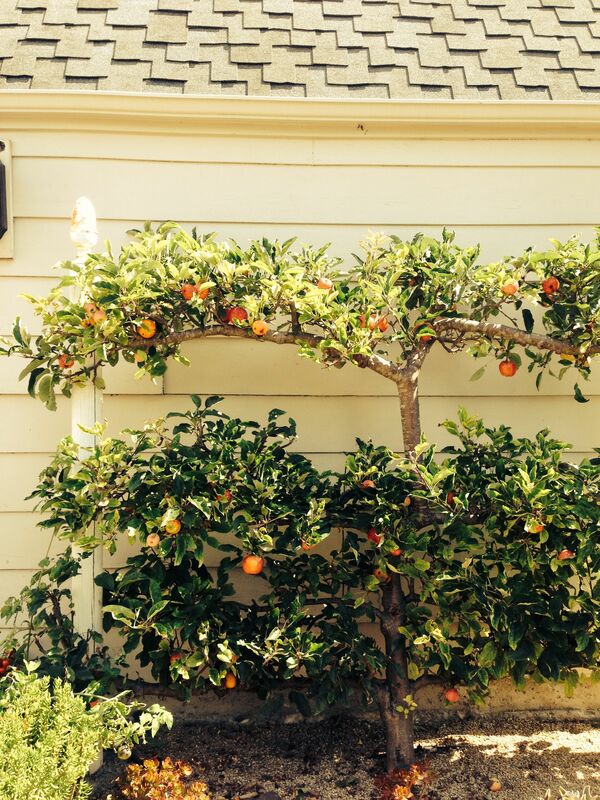 This means that the branch has stopped growing for the season, so pruning will not stimulate additional growth. The best practice is to remove the water sprouts with their terminal buds. Note that some new shoots will be shorter, and horizontal or nearly horizontal. Horizontal shoots (properly called “laterals”) are more likely eventually to bear fruit, so they are treated differently from the vertical or near-vertical shoots. First, consider training these laterals to close to horizontal, using string or V=notched spreaders, to support fruiting. Then the recommended treatment is to prune these laterals back to three buds of new growth after the cluster of leaves at its base. This will stimulate the formation of fruiting buds. Oren Martin, the gardening guru at UC Santa Cruz’s Farm & Garden, says this three-bud pruning system is based on the advice of Louise Lorette a French orchardist of the early 20th century. Pruning your apple tree’s water sprouts and laterals in this manner can be a repetitious and fussy detailed task, but it really will not take long and will contribute significantly to your tree’s vigor and productivity. My practice is to listen to National Public Radio on a portable radio while pursuing repetitious tasks like pruning or weeding. That way I can feel like both a conscientious gardener and an informed citizen. 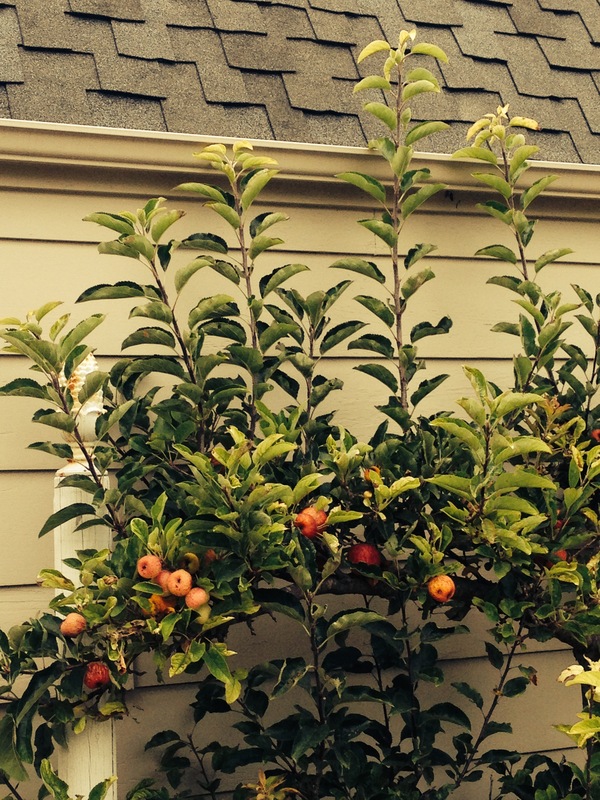 The time for structural pruning of an apple tree is late winter while the tree is dormant and leafless. Winter pruning can stimulate the growth of water sprouts, which are pruned in summer when the tree is not producing new growth. This practice results in less pruning down the line. When the dormant season comes again, we’ll review the art of winter pruning. Now, during the summer months, pick up your clippers and snip away at those water sprouts.